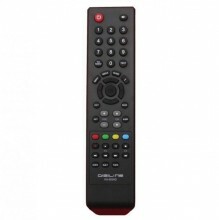 Telecomanda pentru decodor / receptor satelit FOCUSSAT UPC FE11FCS HRB301 K-230 KSC-570 KFS-570 KSC-E620. Telecomanda Kaon model: K230 KSC-570 KSC-E620 KFS-200 KFS-230. Telecomanda Receptor Satelit Kaon Humax, Decodor model: HDPVR NA1410HD NA1600HD. Cross Reference: High Definition Digital Receiver, Digiline KA-003HD DTH, Digi TV Satelit Romania Dolce Romtelecom.